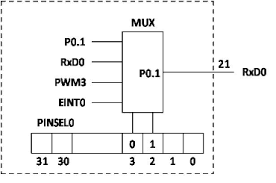 Know how to select a specific functionality of a given LPC17xx pin. Know how to select a pin mode. Every GPIO pin of the LPC17xx is capable of other alternative functionalities. Pin selection is the method by which a user is able to designate the functionality of any given pin. For example, GPIO Pin 0.0 can alternatively by used for CAN channel 1 receive, UART channel 3 transmit, and I2C channel 1 data line. 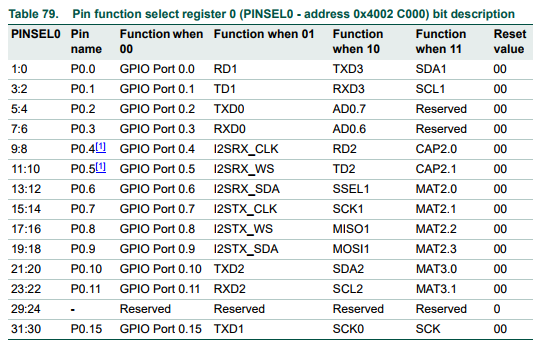 In order to select the SDA2 functionality of pin 0.10, one must set bits 21 & 20 of PINSEL0 register to 1 & 0 respectively. The LPC17xx has several registers dedicated to setting a pin's mode. 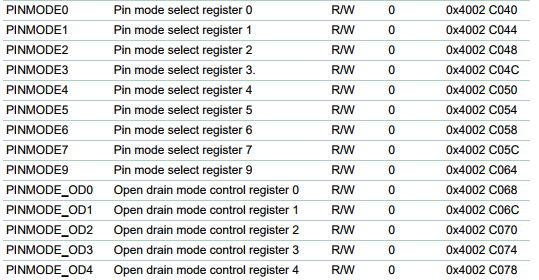 Mode refers to enabling/disabling pull up/down resistors as well as open drain configuration. PINMODE registers allow users to enable a pull-up (00), enable pull up and pull down (01), disable pull up and pull down (10), and enable pull down (11). 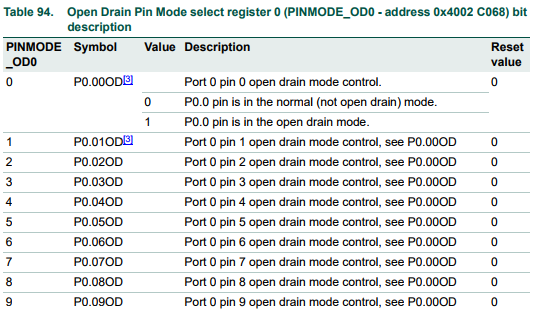 PINMODE_OD registers allow users to enable/disable open drain mode. 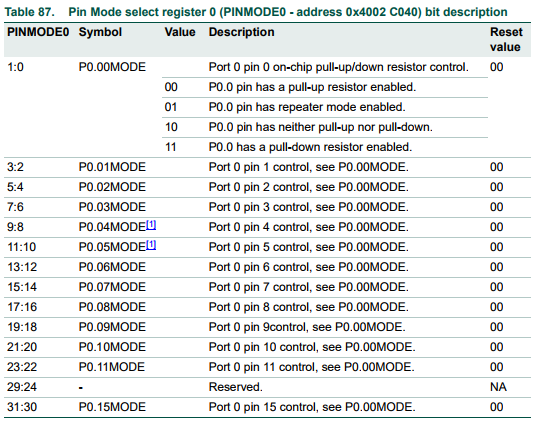 For example, if one desires to configure pin 0.09 to enable a pull-up resistor and open drain mode, one must clear bits 18 & 19 of PINMODE0 register, and set bit 9 of register PINMODE_OD0. You may find it helpful to automate register setting and/or clearing. Per our Coding Standards, inline functions should be used (not Macros).